I often speak and write of my grandmother, for reasons too numerous and intricate to adequately summarize. In her lifetime she was devoted to the arts, to history and literature; she was a humanitarian, a survivor, a lovely soul. She was a lady. And one of my fondest childhood memories was watching the Merchant Ivory adaptation of “A Room With A View” with her, swooning over the scenery and lush score and beautiful, bare-bottomed weirdo Julian Sands. She had been visiting Florence while they were filming, and often spoke of encountering Edwardian-costumed actors taking their lunch breaks in the local cafés and piazzas. We read the book and discussed, played the soundtrack, and she told me that of all the cities she’d visited in her later years, when her husband had passed and her children had grown and the world had made a door for her again, Florence had her heart. 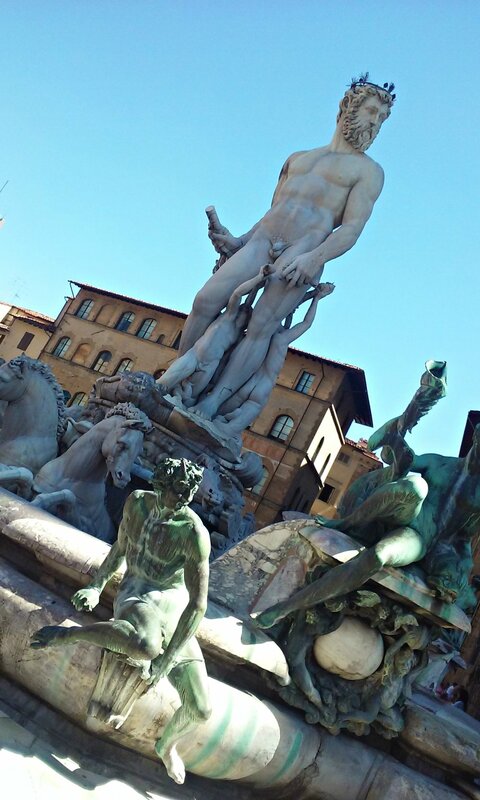 And in hopes of encountering it again, I set off by myself to Firenze for a few days. As someone who has a whole tier of her nutritional pyramid dedicated to coffee, obviously my interest was gluttonously piqued. But the more I learned of Alfonso’s company and sustainable philosophy, the more I became convinced that his story was well worth sharing. Named after the Ponte Vecchio (old bridge), that has long been home to Florence’s most exquisite artisans, Alfonso founded CPF with the mission to produce superior coffee blends that don’t profit from the inferior treatment of the workers producing it. He would later demonstrate with a lighter and CPF coffee capsule the 100% biodegradable, compostable materials used to produce the Nespresso-compatible pods. I was impressed but skeptical—how do you develop a successful brand that ranks among the fiscally elite while maintaining an equal respect and reverence for the growers and workers spanning 9 global regions? It was a sad indication of my Western worldview. The following morning Alfonso picked me up on his Vespa and offered me a Bourne-worthy high speed tour of the Florentine landscape, stopping off at the Pontevecchio headquarters to show me the full range of products, company catalogue and press packet, as well as demonstrate the biodegradability of the materials. From there we met Sole at a café close to the cathedral, and spent the better part of the afternoon conversing in our Italian-American-Argentine trifecta. A: Quality, absolutely. When it comes to roasting we use a handcrafted way to produce the coffee. For example, beans from Colombia need to be roasted for 50 minutes at 180 degrees, whereas Brazilian coffee has a different way. Over the years we learned to work with every coffee per the region it came from. Some companies get coffee from all over, roast it all the same way, then cool it down and package it. The handcrafted way, you separate and mix, and keep testing to find the right blend. Eventually you get a taste that is true to the natural origins. A: (laughing) When I was starting the company, I had only problems. When I introduced friends to the concept of the product, they thought I was crazy. The company started in the garage of my apartment. Some of my partners left because they wanted to go into the market with a lower cost of production, not a lot of concern for the people working in the field, only looking to make a profit. And I’d keep arguing that a company is more than a profit, it’s a social value, that the more WE make the more THEY should make. But you know, I think everyone starts with challenges. The question is, how to turn the challenge into opportunity? A: Our first exhibition was in Dubai in 2015, an expo to sell to prospective airlines. We set up a café, and people were asking “What are you doing here? All these big names and companies, who are you?” By the end of it we’d gotten several contracts with some leading airline companies. Since then we’ve opened boutiques and sold at establishments here in Europe, as well Singapore, Shanghai, and Hong Kong, with upcoming US locations. We’re additionally partnering with Gianfranco Lotti. A: One client came to me and pretty much said we need a capsule that doesn’t contaminate the world. We did the research and started to learn about the recycling system. The problem is, recycled materials take time and aren’t always guaranteed. So we began to experiment with 100% organic, grain based capsules that can either be directly composted into the garden or, when thrown out, will safely decompose within the week. It was a challenge. Plastic contaminants are everywhere, and cheap to utilize, but our client was right—they go against everything we stand for. What’s more, you can’t encapsulate the flavor of nature in plastic. A: Few people know this, but Ponte Vecchio was one of the few areas not destroyed during WWII. ‘Vvittoria’ means victory in our language, spelled with eight letters. 8 is the number of continuity, of the never-ending We Italians love competition, we believe it’s how we express our best creativity. In Italy we have many brands, the competition never ends, but that’s how we improve ourselves. Defeat and victory are part of the same cycle, Italians know this. And I keep it in mind every day when I go to work.